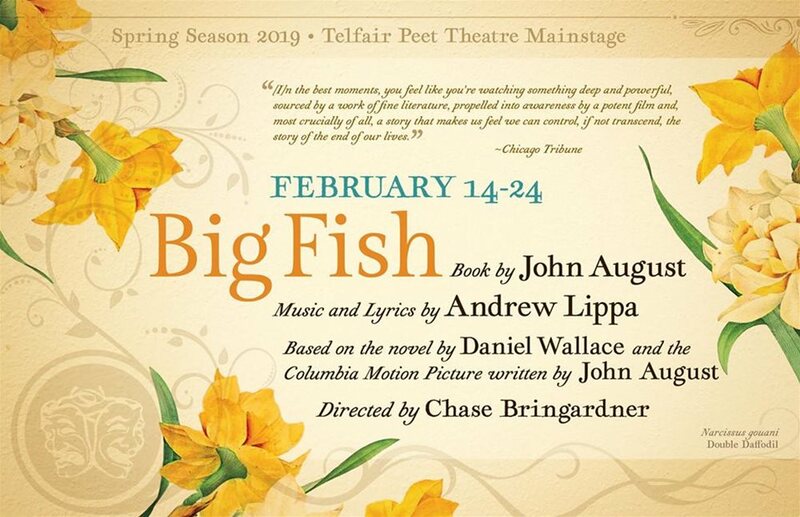 Auburn University Theatre Department will present "Big Fish" on select dates from Feb. 14-24, 2019, at the Auburn University Theatre. Based on Daniel Wallace’s 1998 novel and Tim Burton’s 2003 film of the same name, Big Fish tells the incredibly tall, musical tale of Edward Bloom, an Alabama traveling salesman with a rather heightened flair for the dramatic. While his son struggles with the veracity of his father’s stories and the outside world threatens to intervene, Edward recounts the larger-than-life journeys of his life complete with witches, circus canons, giants, and werewolves. Through Edward’s tales, Big Fish reminds us of the importance of stories, of family, and of community while celebrating a life well lived.